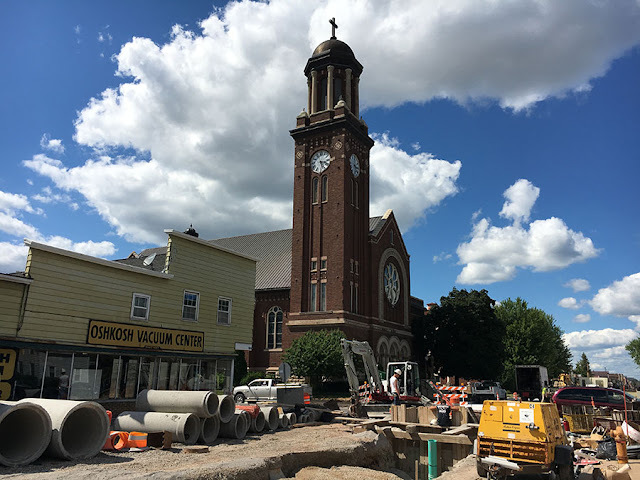 St. Jude the Apostle Parish has been dealing with road reconstruction on Oregon Street this summer and recently learned its new priest had to leave the country to address his immigration status. The consequences of U.S. immigration policy have been brought home to a Catholic parish in Oshkosh, whose newly appointed priest has been sent back to India to apply for a religious visa. In an announcement dated June 1, the Green Bay Diocese said that the Rev. Louis Golamari, who had been working as a parish priest for the last four years in Arlington Heights, Illinois, would be taking over at Oshkosh's St. Jude the Apostle Parish as of Aug. 1. But a letter read to parishioners over the weekend of July 14-15 disclosed that Fr. Golamari, a native of India, was required to return home to apply for a new visa. How long the application process will take is not known, but it could last as little as two months, according to the diocese, or almost a year, according to congressional critics of the current immigration rules for religious workers in the U.S.
Fr. Golamari had been working at Our Lady of the Wayside parish in the Chicago archdiocese. He held an R-1 visa, which is issued for temporary nonimmigrant religious workers. It is unclear why he was required to return to India. Barb Graham, the director of legal services for immigrants in the Archdiocese of Milwaukee, said that foreign priests are not typically required to return to their home country to extend their stays in the United States. But she noted that the immigration process is extremely complicated and that it is easy to run afoul of the rules. “It’s like the obsessive-compulsive Olympics--it really is,” she said. Every case is different and depends on specific facts and circumstances, she said. Officials of the Green Bay Diocese have provided few details about the St. Jude situation and downplayed its significance. “We had a little bump,” said Tammy Basten, the chancellor of the diocese. “The R-1 worker status, when you move from one diocese to another, it doesn’t carry over.” As chancellor, Basten is in charge of record-keeping. Graham concurred that the R-1 visa is only good in a given diocese but said that restriction can be anticipated and avoided. She pointed to some other possible complications. One is timing. A religious visa can be used only for a maximum of five years and is commonly issued for an initial period of just 30 months. Failure to apply for a timely renewal can be a problem under the R-1 program, Graham said. A priest who went from one diocese to another without getting prior approval from the federal government could also be sanctioned, she said. “They have some pretty strict deadlines for stuff, and you’re not supposed to move until you get the move approved,” Graham said. “You really have to be like absolutely spot on” in following immigration rules. Since Fr. Golamari has already been in the United States for four years, it is likely that he would have to move to a different immigration status if he is planning to stay in Oshkosh for very long. This requirement is another possible problem, Graham said. Religious workers who exhaust their five-year R-1 eligibility are placed in a special pool that includes minors who are separated from their parents but have been granted residency in the United States. The size of this pool is capped and has been filled in recent years by young people fleeing gang violence in Central America, she said. As a result a diocese would have to apply with an adequate lead time to make sure that there would be room for their foreign priests to be accepted in this category when their time came. President Donald Trump has tweeted about the danger of terrorists entering the country with religious worker visas, but other leading Republicans say the real problem with the R-1 program is that it is excessively cumbersome and time-consuming. Sen. Orrin Hatch, R-Utah, introduced legislation last year to make it easier for established denominations to bring missionaries into the country. Hatch said the Mormon church applies to bring 1,000 immigrant religious workers into the country each year and that the process can take up to 11 months. A total of about 14,000 R-1 visas were granted in 2016, according to federal statistics. For the time being, St. Jude, which was formed by the merger of the city’s southside parishes and operates at churches on Knapp and on Oregon streets, will be served by a temporary pastor/administrator and visiting priests. In his farewell message to his former parish, Fr. Golamari invoked the spirit of Mother Teresa. His parishioners seemed deeply appreciative of his service. Although he did not know how to drive when he came to the United States, he obtained a driver’s license with the help of lessons from parishioners and let it be known that he was looking to purchase a “nonexpensive, functional” car. A parish family went out and bought him a new one. A distressing situation but the laws mentioned are not unreasonable.